He made us an offer we can’t refuse. October 1, 2013… Early last week I got the first e-mail. This was the nearly frantic report from a friend that Jakafi now costs over $10,000 a month. Worse, his insurance wouldn’t cover it because the company has an $8300 limit. It took a special high price drug request by his eminent hematologist to get the ball rolling. Eventually, it was approved: $10,020 for the basic 60 capsule bottle of 20mg Jakafi pills. How do you respond to something like that? Here’s a drug that is too expensive, rejected by the UK because it’s too expensive, calculated in the pages of the Journal Blood to be three times its cost-effective price. In the past two weeks, over 200 patients have pleaded with Incyte to reduced the price of Jakafi. And Incyte — the company that claims it cares — raises the price? It’s like the rabbi advising the village baker who complains his hut is too crowded with children and in-laws: “Bring in the goat.” The baker leaves the rabbi’s court and brings the goat into the hut. After a week of damage, smells, crashing pots and grief you wouldn’t wish on your worst enemy, the baker returns to tell the rabbi life is now intolerable. “Nu, Take the goat out,” says the rabbi. But there’s no way to make the old Jakafi price feel reasonable…not even by jacking it up 9%. Unfortunately, this pursuit of profit recalls a more contemporary fable of naked abuse of power. It’s true, we looked terrible. We felt weak. We needed a drug badly. He made us an offer we couldn’t refuse. $8400 for a month’s supply. We took it….but complained about the high price. The co-pay. Some of us couldn’t qualify at all. So we sent him a letter. He read it. And then came another offer we couldn’t refuse. The Jakafi price was jacked up by 9%. The new price for us in some markets is $120,240 /year as of September 23. Over the weekend we discussed this “offer” with Incyte. Here are abstracts from our e-mail and the full official Incyte response provided for publication. Dear …. Thank you for calling. I appreciate hearing again of Incyte’s concern for the welfare of MPN patients …. The reason we’re focused on price is twofold: One is the impact on MPN patients; secondly is the impact on our medical care financial system…that has to pick up the tab. By far, our greater and most immediate concern is the MPN patient. I would like to … return to the major issue in which I know we have shared concerns: Making prescribed Jakafi available to MF patients. The price hike initiated last week … needs to be addressed as well. All of us at Incyte respect the sincerity of your comments about Jakafi® (ruxolitinib). We are intensively focused on developing new and innovative ways to treat diseases with serious unmet medical needs. Revenues from Jakafi allow us to continue to research other medical conditions and diseases, including polycythemia vera, where Jakafi may provide benefit to patients. These sales also allow us to invest in additional research to develop new medicines that may address other cancers and diseases with serious needs. We believe Jakafi is making a difference in the lives of patients treated with it, and importantly, we have a strong commitment to providing patients with a robust assistance program that helps ensure that eligible patients in the United States who need Jakafi are able to receive it. Anyone seeking assistance in securing Jakafi or financial help with their prescription can call 1.855.452.5234 or visit www.jakafi.com/IncyteCARES. These are important priorities that all of us at Incyte whole-heartedly support. So what if there was nothing in the Incyte Team response about this price hike? For those of us hoping for a positive response to our appeal it was disappointing. And maybe CEO Paul Friedman — or anyone at Team Incyte at all for that matter — didn’t think our concerns warranted an actual personal response. An anonymous corporate statement is good enough. But to Incyte’s credit, the Incyte Team did offer some justification for pricing. Now the wrinkle is Jakafi profits are needed to fund the swollen fat drug pipeline Incyte built with Jakafi profits. The shameful Jakafi price hike wasn’t enacted to impress Wall Street and shareholders with expanded earnings per share, it was just, according to the Incyte Team, for the selfless purpose of helping cancer patients. You can read about Incyte’s earnings projections and high-flying stock price by googling the company and judge for yourself. 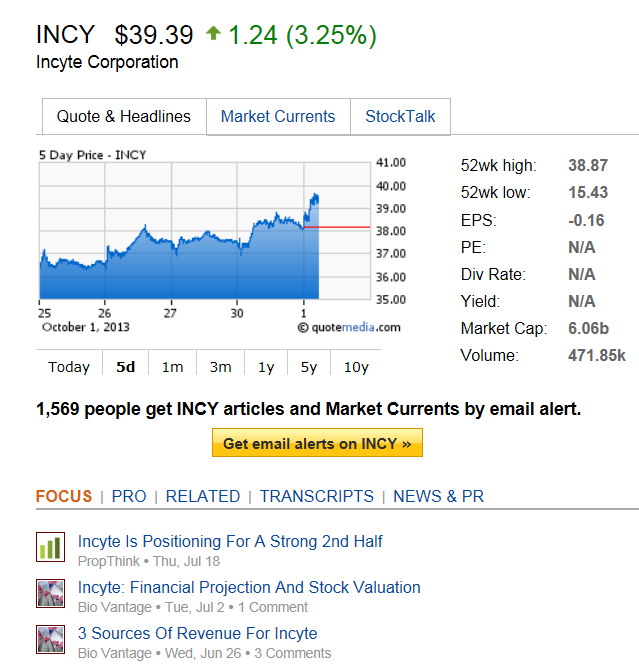 Meantime it might be instructive to see how the savvy Wall Street investors respond to developments at Incyte. Here’s this morning’s results, a week after the stock price took effect. So why did Incyte raise its Jakafi price? For the simplest of all corporate reasons. The company has a monopoly on a drug for relief of splenomegaly and clinical symptoms of myelofibrosis. It may not work for everyone. It may not work long-term. But it works. Incyte raised the price of Jakafi simply because it could. And our options? We can’t refuse. Our only choice, for now, is to take the offer…if we need it, if we can’t wait for newer drugs. If our hematologist can’t come up with another combination that might work. It’s nothing personal. It’s only business. Our MPNs are serious diseases. We know that MPN patients must often be concerned primarily with their own care. Many of us can’t be involved in the battles against drug pricing abuses. A group of physicians and patients are actively organizing to drive down unfairly high drug prices through direct action: publicity, shareholder initiatives, calls for divestiture of profiteering drug stocks and legislative action and regulation. MPNforum will report news of these activities and sites where MPN patients and caregivers can join this effort. My sad story is; I had no income so I applied for Medicaid and got it. On that program they approved Jakafi, then DHS transitioned me to Blue Cross Blue Shield where I was forced to try Hydroxarea, two weeks later I was in the Emergency room with all sorts of side effects, 2 days later I received An email to get Jakafi again, a month later I was denied it again, then DHS told me because I have begun receiving my SS Disability check I can no longer have Medicaid, Now I’m back on self pay and Hydroxarea with no insurance, Side effects are worsening daily. Market place Here I come, So I can start over with getting my Doctor to justify Jakafi. What a roller coaster ride and a full time job healthcare has become. Wow…amazing I don’t take it now, only HU, but someday may need that drug. I hate the system, love your presentation of our difficulty. I sure do love the old story about the goat….being married to a Jewish man for so many years, I remember that one especially well. I am astonished by the actions of Incyte and also agree with Voncille’s comments. I was on Jakafi from mid January 2012 until taken off in late Nov 2012. It worked in shrinking my spleen for about 8 1/2 months and then spleen grew back within the next few months to the 20cm+ it was prior. I have been on two trials since 2003, the first being Zarnestra which actually helped me and I participated for about 3 years before platelets took off. The last trial was SAR302503 which required 10 trips to Mayo Clinic Scottsdale, most of these from Central Oregon which requires 2 days, airline flights, motel, meals, etc. all for the privilege of being part of the trial. This also failed and I was just removed after 9 months and several thousands of dollars in expenses. Now I am looking at going back on Jakafi but waiting on cost to me personally. But it appears the cost has perhaps risen about $2,000 monthly since Jan 2012 which is hard to believe. Although with everything going on with this country, should anything surprise us anymore? Any ideas for other countries like GiGi who aren’t from America but on the trial and were staying alive because of it and now won’t be able to still afford it ? A coordinated effort comprised of hundreds of thousands has a much greater influence than a few hundred. Change.org often obtains, in just a few days, tens of thousands of signatures (or more) with demands for justice and fair play. I sign one of their petitions almost every day, and when I receive news that they have won the fight, to be a tiny part of the success is a grand and rewarding feeling Some of these successes include battles by dying patients against drug companies. The dragon induces more fear than the flea (A fake Chinese saying!) Anyway, it was just a thought. You could be right, Ron…the only way to find out is to try it. I’ll sign. We need to stop complaining while Big and Little Pharma and their associated chain of suppliers and insurers fatten off each price hike. The beginning of wisdom for us is to realize how powerless we are in face of this massive gluttonous feeding frenzy. To me, organizing our separate parts is the path to power. If you think we can do it through Change.org, have at it, I’m right behind you. As to your question: MPNforum has several parts. MPNforum Magazine is an editorial medium following traditional standards of journalistic research, fact-checking and objectivity. A free press, guaranteed by the Constitution, is an essential watchdog reporting on business and government and equally essential to us a patients as a reliable source of scientific and medical news. We can report on drug company abuses. We can take an editorial stand on drug company abuses. We can’t convert MPNforum into an activist propaganda Instrument without sacrificing its core values. We sponsor non-editorial projects: The Fatigue Project is one. MPNclinic is another. The MPNforum Facebook page is another. You want it make it work, open a Facebook page, get a name and fly a flag we can march under… Mmm. Dragon. BLOC DRAGON…. Blood Cancer patiients against DRUG company GOUGING …something, something. I just don’t want to see our justifiable rage at these practices peter out into something ineffectual.. I applaud your spirit. While I can understand the value of a concentration of efforts, it seems to me that any and all petitions whether Change.org or personal letters to news outlets or congress or the President, or church, club and waiting room brochures, etc. etc. do not fragment the efforts of MPNforum so much as they supplement it and should be encouraged. A rifle may be a more lethal weapon, but a shotgun has a better chance of hitting the target. A. If I confused the issue, Arch, sorry…but I’m NOT talking about an MPNForum effort. The process already underway by Dr. Hagop Kantarjian and the 100+ hematologists calling for a reduction in blood cancer drug prices is the physician part of this effort. The patient support arm of a concentrated effort to bring effective force to bear on legislative and financial groups is just forming. It will not operate under or be part of MPNforum Magazine. All we did was publish on open letter and invite comment. Of course anyone is welcome to organize a petition, write letters, carry placards, and shout our message from the rooftops. There’s totally nothing wrong with that. But if we want to mount an effective campaign that produces results we have to do it together with the full weight of a united group of patients. As patients, we don’t have a leader or the organizational structure in place yet. But it’s starting to come together. Beyond that, many patients spent much of their own money traveling to and from the clinical trials, risking their own safety in the experiments that led to its marketing. This is the reward for their efforts. This is what happens when you live in a nation in which making a living is not the goal. Making a killing is the target. I agree with Ron! I have participate in 3 clinical trials since 2006. We have paid every dime for gas, meals and hotels. We travel 500 miles round trip to MD Anderson in Houston. I risk my life not only through the studies, but also traveling. That’s my greatest fear, an auto accident. With platelets lower than 40,000 most of the time, I’d be dead before help would get to me. What about the hospital charges to the patients while conducting their studies? The patient just never stops handing out money hand over fits….while trying desperately to live. It’s incredible to me that although the MPN community’s participation in the original studies where the donation of our blood samples is what enabled the identification of the Jak II mutation in the first place, Incyte is behaving this way. DEPLORABLE!!! Susan Fogelson, PV for 11 years. Has anyone inquired as to how much Incyte spends on advertising and marketing their drugs? It might be as skewed as most drug companies, which spend 17 times more on marketing than on research. Raising their price in light of receiving hundreds of complaints is clearly retaliatory. Incyte is letting the patients know who the boss is. Have you heard of Change.org., a website that fights for the underdog. One can post a protest there and reach a far greater audience that the mere 200 people who wrote to Incyte. Change.org has overturned many unjust situations when all else failed. Posting a plea there is free and easy. I can understand Ron — and share — your outrage and while it’s possible I doubt the price increase is retaliatory. But with a price increase as part of the Incyte strategic plan requiring planning and implementation, you can understand how our pleas for reducing the Jakafi inflated price would fall on deaf ears. I think we should avoid fragmenting efforts by filing separate petitions. We are starting to organize. There are patients and physicians already onboard developing coordinated programs to bring down blood cancer drug prices. (Pegasys is no bargain, either.) So Ron, join in or take charge of a project. Let’s keep MPNforum as an editorial medium. What we need is coordinated action.